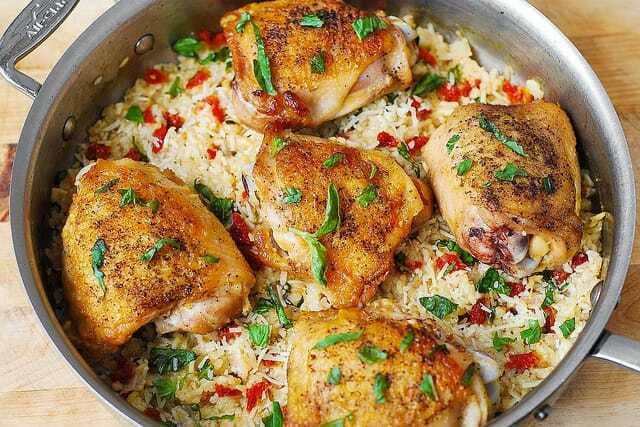 Chicken Thighs with Sun-Dried Tomato Basil Rice – delicious, easy, one-pan Italian-inspired recipe. Gluten free. Great Summer dinner! It will keep you full, yet it’s light and not overly heavy. 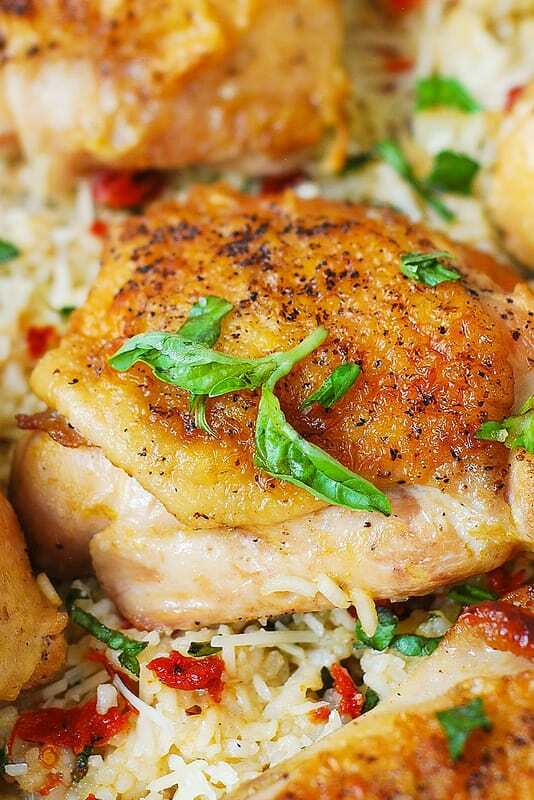 You will fall in love with this Mediterranean style chicken dinner: flavorful rice cooked in chicken broth and in juices from chicken thighs, then mixed with chopped sun-dried tomatoes, chopped fresh basil leaves, and shredded Parmesan cheese! Chicken thighs are moist and juicy, and everything is cooked together in one pan to minimize the cleanup. 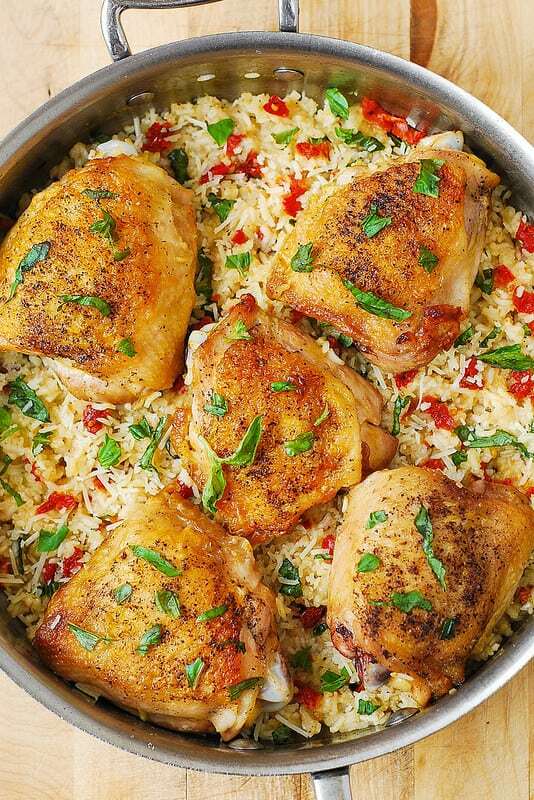 If you want something refreshing, light and not so heavy, – you will love this Mediterranean style chicken and rice! 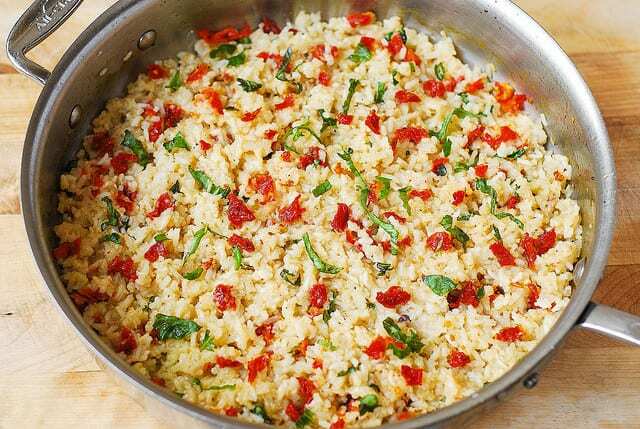 Sun-dried tomatoes and basil are a great accompaniment to rice! My recipe instructs to drain the sun-dried tomatoes from oil, but if you’re looking for more delicious ways to add olive oil to your diet, go ahead and add some of the olive oil from the sun-dried tomato jar to your rice – I think it makes the rice even more delicious! See the recipe below for details. 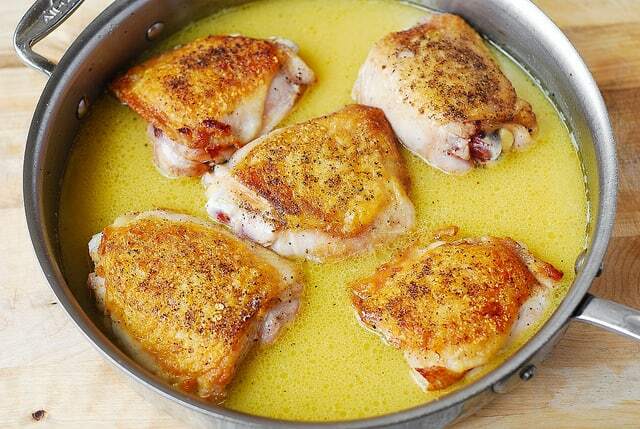 Start by cooking chicken thighs in 1 tablespoon olive oil in a large skillet on medium-high heat. Sear them skin-side down, for 5 minutes, until skins get golden brown color but don’t get burned. Then, flip the chicken thighs to the other side and sear for 2 more minutes on medium heat. In this photo, I have cooked chicken thighs for 5 minutes, skin-side down, on medium-high heat – see how the bottom of the pan is not burned? Yet the skins have nice golden color (see next photos)! 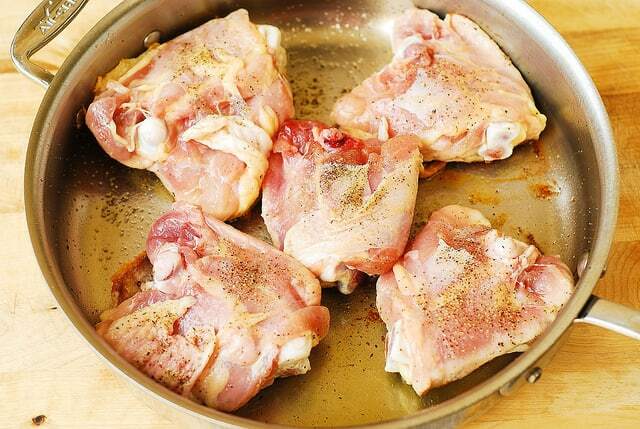 Remove the chicken from the skillet (it will not be cooked through – you’ll continue cooking it in the next steps). To the same (now empty) skillet, add chicken broth, water, uncooked rice, 1/4 teaspoon salt. Bring to boil. Mix everything well. Put chicken thighs on top, making wells for them in the rice. Add chopped sun-dried tomatoes, drained of oil, chopped fresh basil, and shredded Parmesan cheese to the skillet with rice (without chicken). Mix everything. Taste, and add more salt or olive oil from the sun-dried tomato jar, to taste. I added at least 2 tablespoons of olive oil from sun-dried tomatoes to the rice – but it’s up to you! 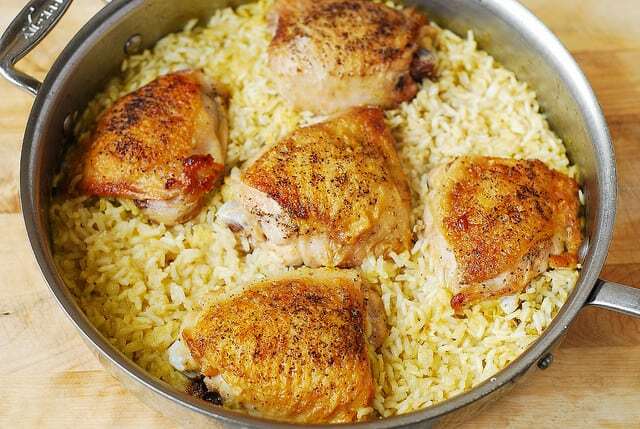 You might skip adding the olive oil altogether, the rice is very flavorful with or without it. Place cooked chicken thighs on top of rice, garnish with more fresh basil. 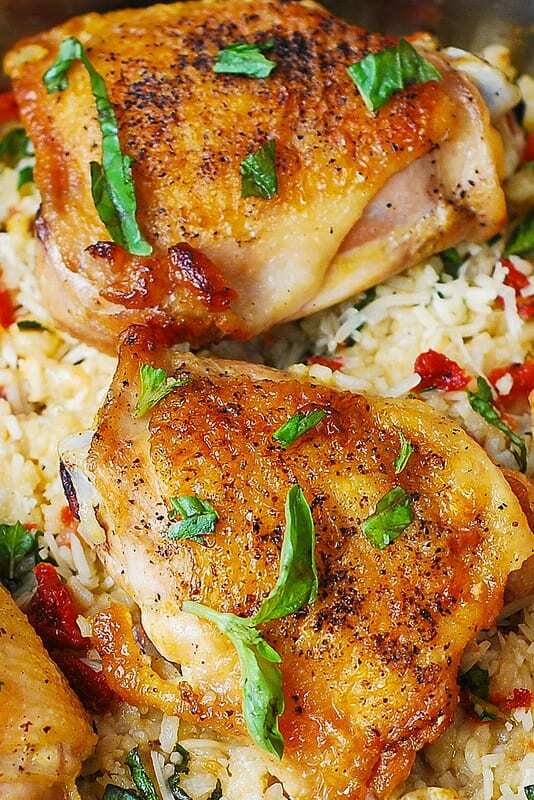 Chicken Thighs with Sun-Dried Tomato Basil Rice - delicious, easy, one-pan Italian-inspired, Mediterranean recipe. Gluten free. Great Summer dinner! Chicken thighs are moist and juicy, and everything is cooked together in one pan to minimize the cleanup. Heat a large skillet on medium-high heat until hot. Add olive oil - it should run easily because the skillet is hot, but not sizzle or smoke. Generously season both sides of chicken thighs with salt and pepper. Sear them on high-medium heat in the skillet, skin-side down, for 5 minutes, until skins get golden brown color but don't get burned. Skillet should not be burned on the bottom. Flip the chicken thighs to the other side and sear for 2 more minutes on medium heat. Remove the chicken from the skillet (it will not be cooked through - you'll continue cooking it in the next steps). To the same (now empty) skillet, add chicken broth, uncooked rice, 1/4 teaspoon salt. Bring to boil. Mix everything well. Put chicken thighs on top, making wells for them in the rice. Reduce the heat to low boil simmer. Cover the skillet with the lid. Simmer for 15-20 minutes, covered, on low boiling simmer, until the rice is cooked through, and the chicken is completely cooked through (no longer pink in the center). 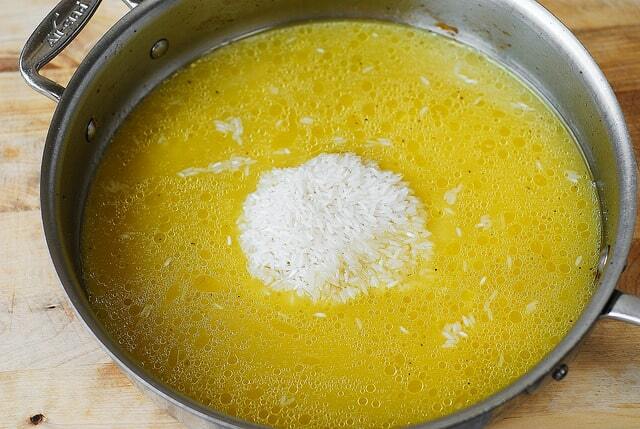 If the rice absorbs all of the broth but is still tough, add about 1/2 cup water to the rice, cover with lid, and cook on low simmer until all water is absorbed, and the rice is cooked and tender in texture. Remove the chicken from the skillet. Add 1/2 cup of sun-dried tomatoes, drained of oil and chopped into smaller bites, chopped fresh basil (about 10 large leaves), and 1/2 cup of shredded Parmesan cheese to the skillet with rice (without chicken). Mix everything. Taste, and add more salt or olive oil from the sun-dried tomato jar, to taste. Put cooked chicken thighs on top of rice, garnish with more fresh basil. Could i do this in a Dutch oven? My skillet doesn’t have a lid. Not sure about Dutch oven. You can definitely do this recipe in a cast iron skillet.